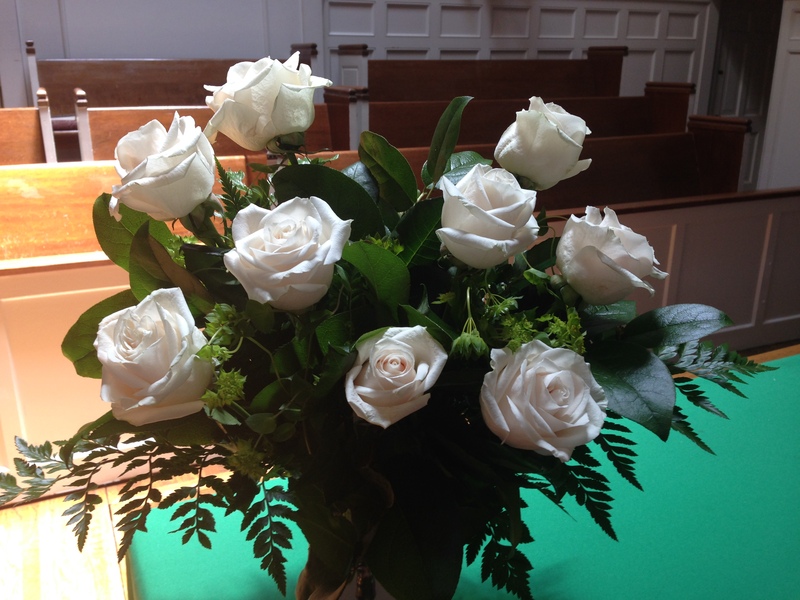 We had nine white roses on our communion table last Sunday. Nine white roses, one for each of the victims of the shooting that took place in a church. As I stood up to give the Pastoral Prayer at my church last Sunday, and asked those in worship to look at the roses, the breath and depth of this tragedy overwhelmed me. I have been deeply bereft since I first heard about it, but looking out at my congregation, people who have come to worship and praise God, the lump in my throat got to me. Yes, we are a mostly white, suburban church just outside of Los Angeles in the community of Studio City. We don’t live day to day with the possibility that something like what happened in Charleston could happen to us. But then I had to think, does anyone ever think something like this unspeakable act would ever happen to them? Did the people sitting in a movie theatre? Did the parents who dropped their young children off at school? For those who have lived their lives with this as an all too common possibility, my heart grieves. The more I try to make sense of what occurred, and I admit making sense of it will never fully happen, I am faced with a sad reminder of the degree of hate that breeds in our country. This cancer of prejudice has gone on far too long. One would hope that in the 21st century, with better education, and forums to discuss and dialogue with others, that some greater understanding would have come upon us by now. Sad to me that this has not happened, but that those who continue to hate, lash out, and demean seem to do so with a righteousness that is all too scary to believe. People who hate seem to have a sense of entitlement to their hatred. It has been past down to them like a priceless family heirloom and is now proudly displayed on their mantle for all to see. This grieves me deeply. Where is the love for all people, the compassion of the Christ that we are to live out in ministry to others? It is lacking in far too many people. Many of those who hate would, without reservation, call themselves “church people.” If they are, it is a church I couldn’t begin to comprehend and a worship of a type of God that I could never begin to understand and embrace. We are called as children of an unconditionally loving God to be inclusive of all. We are given the example by the Christ to reach out in understanding to those who may seem different to us. The differences we perceive are cosmetic perhaps, or they are in the DNA that makes us who we are, but the totality of all that we are makes us each a valuable and wonderful individual expression of a loving God. The truth is that as creations of God, in God’s image, we are all precious and valuable. Our uniqueness from one another is a lovely gift that we offer to the world for the complete fulfillment of a thriving community. So, why all of this hate? My favorite lyricist is Oscar Hammerstein II. To me this amazing man is not only a poet, but a theologian and a mystic. His powerful lyrics, often to music by Richard Rodgers, have been sung in churches and cathedrals to inspire many. “Climb Every Mountain,” a message of hope in the face of despair and fear, “You’ll Never Walk Alone,” (sung at my ordination into ministry), is a song of the continual presence of God moving in and through our lives to direct and guide us at every moment. Powerful messages that inspire us to continue when times are tough. And still there is a current of hatred that is cancerous in our land. Why? Nine white roses on our communion table this past Sunday at First Christian Church of North Hollywood in memory of the nine victims of the shooting in Charleston. May their death not be in vein. May God’s Spirit of reconciliation, love, comfort and peace have the final word. That is my prayer. Richard Rohr in his book The Naked Now reminds us that we don’t pray to Christ, we pray through Christ. If we pray to Christ we can be locked into living a faith that has a perception based on our own limited and finite beliefs, our personal filter of experience. But when we pray through Christ suddenly we are opening ourselves up to experience the Divine more fully and to expand our perception and experience of Spirit’s living, breathing and energetic presence. Rohr goes on to tell us that our purpose in this new awakening is to cooperate with what God already is doing in our lives. We always start from right where we are, so start with the belief in new possibilities and with the ability of God’s perfect Spirit in you to transformation all that you now experience. Through Christ we can experience more fully, understand more clearly and our “seeing” can have a new perception of the workings of God more fully realized in our lives. When we pray through Christ the filter changes. It becomes less our filter and more Christ’s filter. That one shift can make everything change. This is powerful for us to contemplate. We cooperate when we pray through Christ to be in perfect alignment with that vibrating energy of the Divine. God is forever directing us in our prayers so that we may have a conscious awareness of this perfect power working in our lives. We know that we cannot recognize something without first having some kind of awareness of its existence. So, our prayers become a powerful way for us to develop a new awareness and see a new truth within that vision. It is the Christ that is leading us ever so gently on our path. Never too fast for us to understand or experience, but just at the right pace for us to be moved, changed and renewed. We each experience this Christ presence in different ways for it has been individualized for each of us so that we may become our own unique expression of God’s wonderful creation. God is one. We read in the Hebrew texts that there is but one God and for the people of ancient times this was a radical idea. The prevailing belief of the time, that there were multiple Gods each with a specific job and purpose, was being challenged. The God in whom we are called to believe in is one who is available to us to meet whatever need we may have. Health, prosperity, relationships, discernment for what is next for us, making sure the sun rises and sets and that the tides flow in and out, this same God can meet all of those needs and more and does so out of a love and a desire for us to live abundant lives as whole and fulfilled individuals. One God. God is everywhere present, fully powerful at each place in the universe. Wherever we are we are at the center of all that is the magnificence of God. If we travel to the ends of the earth we are still in the center of God. Those whom we lift up in prayer, even if they are on the other side of the earth, are also at the center of God. The fullness of all that is God is with us, and is also with them. This is a beautiful realization for all of us. We live, and move, breathe and thrive within the very presence of God. This means that we can never be apart from God except to the degree that we separate ourselves through our own lack of belief and trust. Throughout our day we can turn within and affirm that we are still, and always will be, at the center of a powerful God who moves through us in each thing that we experience. The fullness of God and the presence of God is not something that we must earn, for it is given to us freely, lovingly and generously. This had to be a radical idea to an ancient people who felt that they not only had to earn their God’s favor, but that they could lose that favor at any moment. How blessed we indeed are to know how much we are loved and that this amazing love is always right where we are at every moment.